I have some wonderful news to announce today. I am a new member of the Elle's Studio Design Team!!! This is such a dream come true for me. Blessed and thrilled are the two words that come to mind at this moment because I am seriously beyond thrilled and I feel so very blessed for this new design team opportunity! Of course, I've been playing with all kinds of yummy Elle's goodies recently too and I can't wait to begin sharing them with you. For now though, here are the layouts I submitted as part of my design team application. 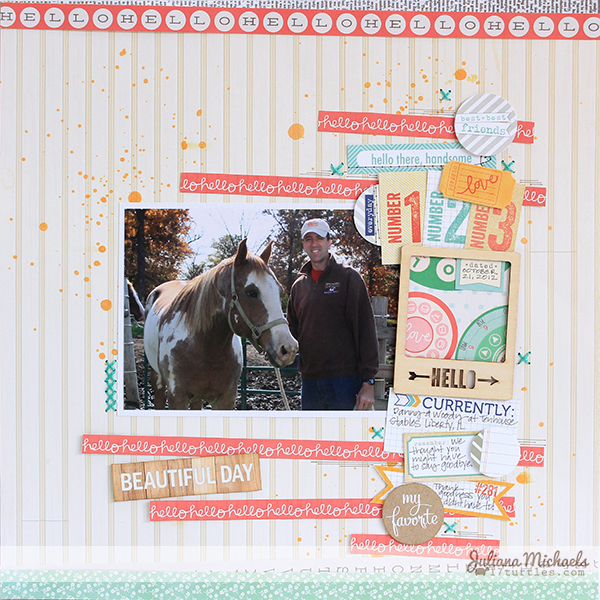 I also just recently posted a couple layouts using the Penelope collection. One called "LIFE IS GOOD" and the other "ADORABLE YOU". Thank you so much for sharing in my joy and excitement today! And I am really looking forward to creating, sharing and hopefully inspiring you with my Elle's Studio projects. HUGE CONGRATS Juliana!! So EXCITED for you!! These are all gorgeous!!!!! Congratulations! This is certainly an honor that you deserve! Looking forward to seeing all your wonderful work! Yay!! So excited for you Juliana!! And I love the layouts you sent in for your application! Awesome work!! Congrats Juliana!! They are lucky to have you! So happy for you my friend! Congrats! CONGRATS! Excited to work with you! And love the layouts! Gorgeous! Congrats! They are lucky to have you. I love these two layouts! Congrats~~~ You are a PERFECT fit for this team! Can't wait to see you create! congrats!!! Cant wait to see what you create with Elle's studio products! and so honored to be on same team with ya!